Panasonic has officially launched the Leica DG Vario-Elmarit 12-60mm F2.8-4 ASPH, a lens we first saw at Photokina last September. The 12-60mm functions like a 24-120mm in the 35mm format, and uses weather-sealed construction for shooting in well below freezing conditions. Smooth bokeh is a goal of this lens, with a nine-blade aperture, while the Panasonic Nano Surface Coating is designed to reduce ghosting and flares. With 14 elements in 12 groups and four aspherical and two ED elements, the lens is designed for a variety of shooting situations, from portraits to landscapes. 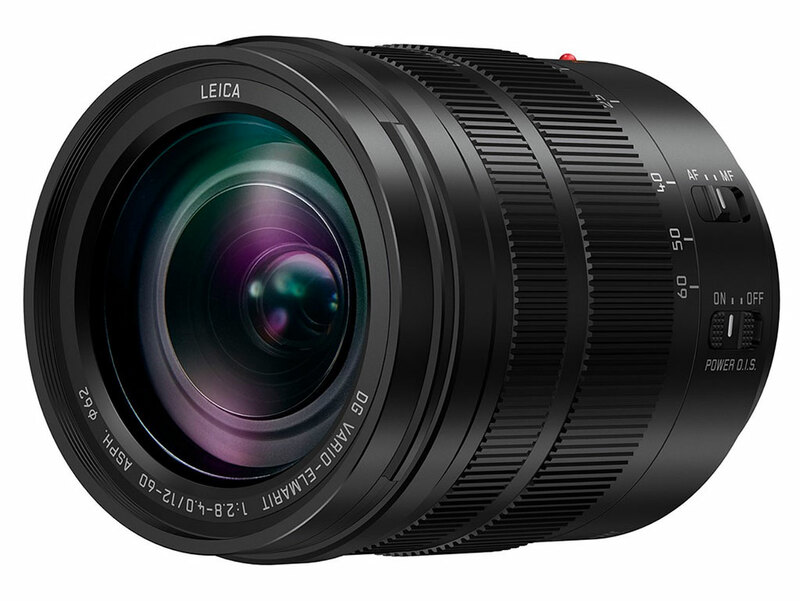 The lens will ship in March, and has a $999 price tag. Built-in image stabilization works in conjunction with the 5-axis stabilization on Panasonic cameras that have vibration reduction. The LUMIX G Vario 45-200mm / F4.0-5.6 II / POWER O.I.S. and LUMIX G VARIO 100-300mm / F4.0-5.6 II / POWER O.I.S. now have both dust and splash protection, giving nine lenses in Panasonic’s G lineup the ability to withstand more challenging conditions. Panasonic says the new lenses “excel in video recording performance” thanks to quiet motors and a micro-step drive that allows the camera to keep consistent brightness during zooms and pans. The press release for both announcements are below. Las Vegas, NV (January 4, 2017) – Panasonic is proud to introduce a new standard zoom digital interchangeable lens, the LEICA DG VARIO-ELMARIT 12-60mm / F2.8-4.0 ASPH. / POWER O.I.S. (35mm camera equivalent: 24-120mm) as the first lens to be introduced from its LEICA DG VARIO-ELMARIT F2.8-4.0 Series. Covering a focusing distance from ultra-wide angle to super telephoto, this new LEICA DG VARIO-ELMARIT F2.8-4.0 Series achieves exceptionally high descriptiveness for both photo and video recording, and yet its size is kept compact. All of the lenses in this series feature a 9-blade diaphragm to give the aperture a rounded shape that produces an attractively smooth effect in out-of-focus areas when shooting at larger aperture settings. All lenses also take advantage of Panasonic’s Nano Surface Coating technology to minimize ghosts and flaring. They boast a rugged, dust/splash-proof design and are even freeze-proof down to -10℃ to withstand professional use under harsh conditions. The high-quality video recording capability is also one of the advantages of this lens series. The new LEICA DG VARIO-ELMARIT 12-60mm / F2.8-4.0 ASPH. / POWER O.I.S. offers a versatile 5x zoom range of 24-120mm. It fully covers a variety of daily shooting situations, from dynamic landscapes to portraits even in low-lit situations, providing a beautiful defocus effect by taking advantage of the F2.8-4.0 high-speed performance. Comprising 14 elements in 12 groups, the lens system features four aspherical lenses and two ED (Extra-low Dispersion) lenses that effectively suppress spherical distortion or chromatic aberration to achieve stunning picture quality. The use of these lenses also enables high mobility. In addition to the wide aperture, the POWER O.I.S. (Optical Image Stabilizer) effectively compensates for blurring, making it easy to shoot even in dim lighting. The lens works with the Dual I.S. (Image Stabilizer)*1, 5-axis Dual I.S. *2, and 5-axis Dual I.S.2*3 system when mounted on an applicable Panasonic LUMIX DSLM (Digital Single Lens Mirrorless) camera. The linear motor enables the camera to comply with the sensor drive at max. 240 fps to take full advantage of cameras with high-speed, high-precision Contrast AF. It also helps to reduce wobbling. Notably, the new lens excels in video recording performance. In addition to the silent operation achieved by the inner focus drive system, the micro-step drive system in the aperture control section helps the camera to smoothly catch up to brightness changes when zooming or panning. The optical design achieves exceptional barycentric stability to minimize image shifts during zooming. The AF tracking performance in zooming is also improved thanks to high-speed frame analysis for focus control. Offered in sharp, metallic black color, the new LEICA DG VARIO-ELMARIT 12-60mm / F2.8-4.0 ASPH. / POWER O.I.S. stylishly matches the LUMIX G DSLM cameras. The LEICA DG VARIO-ELMARIT F2.8-4.0 Series lineup will expand with additional lenses. An 8-18mm (16-36mm, 35mm camera equivalent) wide zoom lens and 50-200mm (100-400mm, 35mm camera equivalent) telephoto zoom lens are presently under development. Las Vegas, NV (January 4, 2017) – Panasonic is renewing four LUMIX G digital interchangeable lenses to gain higher performance and mobility: the LUMIX G X VARIO 12-35mm / F2.8 II ASPH. / POWER O.I.S. (H-HSA12035), LUMIX G X VARIO 35-100mm / F2.8 II / POWER O.I.S. (H-HSA35100), LUMIX G VARIO 45-200mm / F4.0-5.6 II / POWER O.I.S. (H-FSA45200) and LUMIX G VARIO 100-300mm / F4.0-5.6 II / POWER O.I.S. (H-FSA100300). All of these new lenses comply with the advanced functions of the latest LUMIX G digital cameras. In addition to the POWER O.I.S. (Optical Image Stabilizer) in each lens, they work with Dual I.S. (Image Stabilizer)*1, 5-axis Dual I.S. *2, and 5-axis Dual I.S.2*3 system when mounted on an applicable Panasonic LUMIX DSLM (Digital Single Lens Mirrorless) camera. The LUMIX G VARIO 45-200mm / F4.0-5.6 II / POWER O.I.S. (H-FSA45200) and LUMIX G VARIO 100-300mm / F4.0-5.6 II / POWER O.I.S. (H-FSA100300) boast dust/splash-proof durability. A total of nine lenses in the full LUMIX G lens lineup now feature a rugged design to withstand use under harsh conditions. Notably, the new lenses excel in video recording performance. In addition to the silent operation achieved by the inner focus drive system, the micro-step drive system in the aperture control section helps the camera to smoothly capture the brightness changes when zooming or panning. The AF tracking performance when zooming is also improved thanks to high-speed frame analysis for focus control. The LUMIX G VARIO 45-200mm / F4.0-5.6 II / POWER O.I.S. (H-FSA45200) and LUMIX G VARIO 100-300mm / F4.0-5.6 II / POWER O.I.S. (H-FSA100300) now complies with the sensor drive at max. 240-fps to take full advantage of cameras with high-speed, high-precision Contrast AF. These lenses are designed to match LUMIX G DSLM cameras. *1 Complies with the LUMIX GX8. *2 Complies with the LUMIX GX85. *3 Complies with the LUMIX GH5 and G85. A 24-70mm* full-range F2.8 fast standard zoom lens with a rugged design for high picture quality and performance. ・Versatile usage ranging from portraits and landscape to street photography. ・Achieves handheld shooting without using a flash thanks to the F2.8 high-speed aperture and 5-axis Dual I.S.2. even in low-lit situations, including indoors. ・Splash/dust-proof and freeze-proof down to -10℃ with a rugged design for heavy field use. ・Supports high-quality video recording(as described above). ・The lens system comprises 14 elements in 9 groups including 4 aspherical lenses with 5 aspherical surfaces, 1 UHR (Ultra High Refractive Index) lens and 1 UED (Ultra Extra-Low Dispersion) lens. ・Panasonic’s black box technology Nano Surface Coating is applied to minimize ghosts and flaring. ・Max.240-fps sensor drive for high-speed, high-performance AF. The HSA12035 will be available in black for $999.99 in March. A 70-200mm* full-range F2.8 fast standard zoom lens with a rugged design for high picture quality and performance. ・Allows high-speed shutter release, and provides beautiful defocus effect in portrait or close-up shots. ・Achieves handheld shooting without using a flash thanks to the F2.8 wide aperture and 5-axis Dual I.S.2. even in low-lit situations including indoors. ・Supports high quality video recording(as described above). ・The lens system comprises 18 elements in 13 groups including 1 UED (Ultra Extra-Low Dispersion) lens and 2 ED (Extra-Low Dispersion) lenses. ・No front lens rotation/ length extension in zooming. The HSA35100 will be available in black for $1099.99 in March. ・Achieves handheld telephoto shooting with POWER O.I.S. and 5-axis Dual I.S.2. ・Rugged, splash/dust-proof design for heavy field use. ・The lens system comprises 16 elements in 13 groups including 3 ED (Extra-Low Dispersion) lenses. ・Multi coating to minimize ghosts and flaring. The FSA45200 will be available in black for $449.99 in February. ・The lens system comprises 17 elements in 12 groups including 1 ED (Extra-Low Dispersion) lens. The FSA100300 will be available in black for $649.99 in February.